The temple of Lepakshi has many curious stories around it, which seem like fairy tales, but if we dig deeper, we find evidence of these strange stories. Did Giants exist a long time ago, and if they did, did they build these incredible structures at Lepakshi? Even though archeologists argue that this temple was built just 500 years ago, locals are convinced that this temple was built much earlier by gods of giant stature. Of course, there is a huge footprint in this temple, which could belong to a giant that stood around 25 to 35 feet, but we’ll get to this in a minute. Watch the video below or read on. 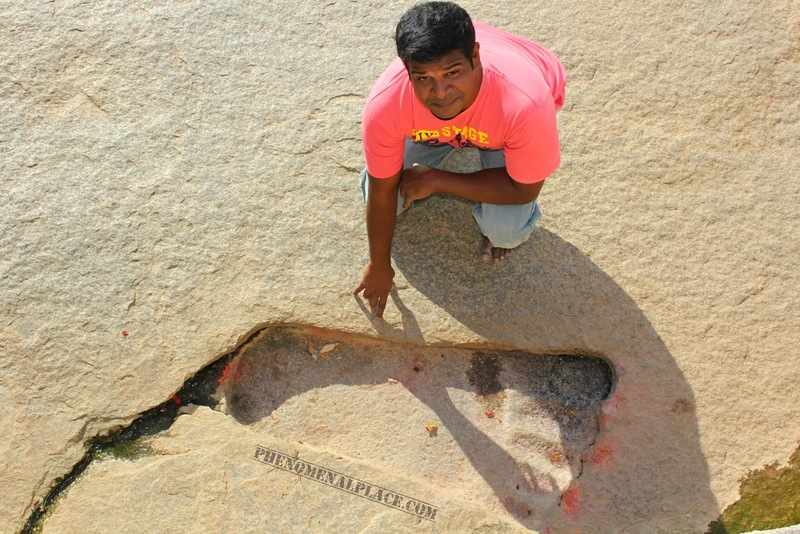 The best evidence is not this foot print found inside the temple, it is this giant bull carved 500 meters outside the temple of Lepakshi. 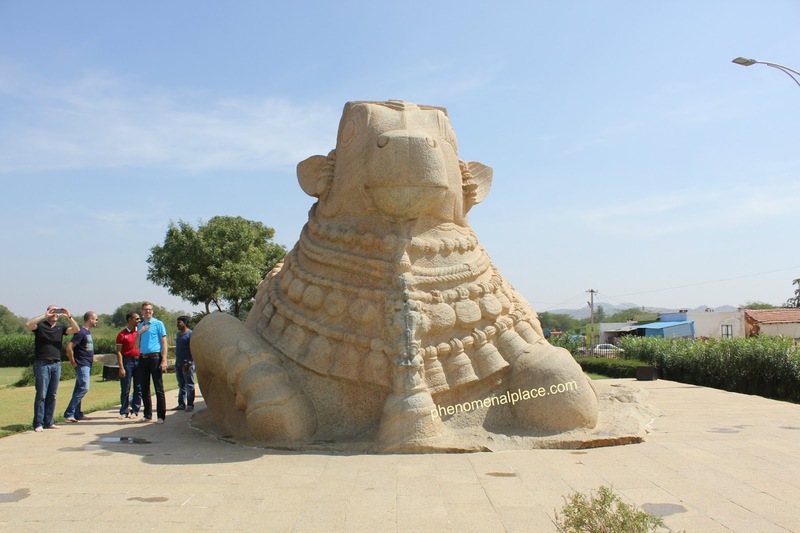 The town of Lepakshi has the largest carving of the Indian Bull or Nandhi in the world. Made out of a single rock, this bull is exquisitely carved and stands nearly 15 feet tall and 27 feet long. Archeologists say this Bull was created just 500 years ago. But there is something very strange about this bull, it stands alone. According to sacred Indian architecture, every bull must be associated with a lingam and vice versa. Ancient Indian texts confirm that the bull must be carved in front of a lingam. But as you can see, there is no lingam in front of it. Why would ancient builders carve the world’s largest bull and forget to put a lingam, which is the main god? Why did they create this brilliant monolithic carving and leave it alone? Archeologists don’t have the answer to this question, but locals do. The lingam associated with this bull is found 500 meters away, inside the temple walls. This gigantic lingam stands nearly 12 feet tall, and is protected by a 7 headed reptilian god known as Naga. 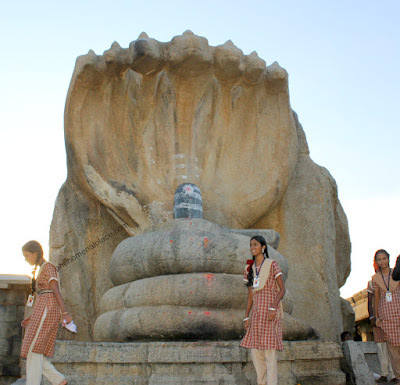 This type of lingam is called Nagalingam and what you are seeing is the largest Nagalingam in the world. And if you look around this lingam, you see something interesting..there is no bull in front of it. So, what is the purpose of carving a bull in front of a lingam? I have always argued that every sculpture in Indian temples was made for a reason, so how was the bull used? Ancient Vedic texts mention a way of worshiping the lingam, which is forgotten today. The ancient people put 2 fingers on the horns of the Nandi, and viewed the lingam through it. Hindus strictly followed this routine until the last few centuries. This was the actual purpose of the bull. 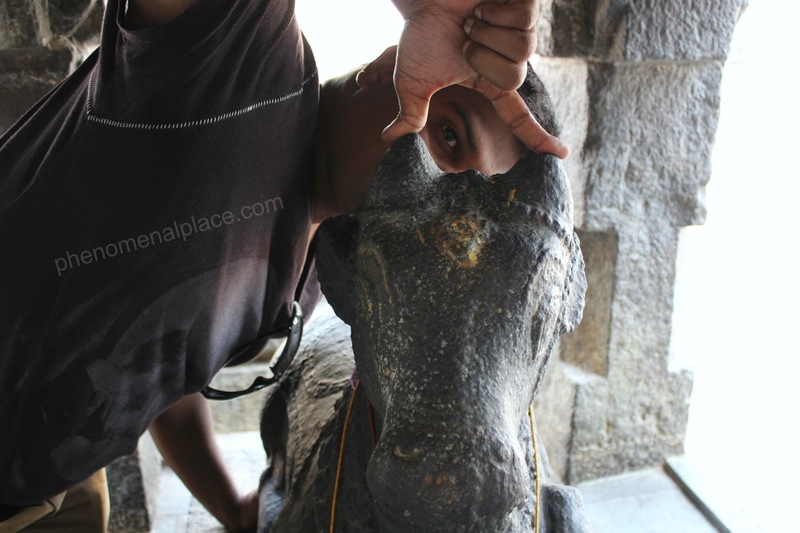 If you climb on this huge bull and look through these 2 horns, you can see the gigantic lingam, even today. Of course, this not only confirms that this bull belongs to this lingam, but something much more astounding. The race that created these carvings, must have been tall enough to view the lingam through these horns. Since the bull is 15 feet high, the ancient builders must have been around 30 feet tall. Today, if you view through the horns, you will only see half the lingam, because the temple walls prevent you from seeing the rest of it. Why would the ancient builders create a wall, and a temple leaving the bull outside? The lingam and the bull were built by a race of giants but the newer temple which is what we see today was built in the last 500 years. If you compare these 2 figures with the rest of the features, we can see a striking difference. The original builders used a monolithic architecture. Both these structures are not only much bigger than everything else, the lingam and the bull were also made out of single rocks. The new architecture is quite different. Let’s take a look at these walls – huge slabs were cut and were interlocked, similar to Machu Picchu in Peru. Don’t get me wrong, this is also extraordinary technology, it is extremely difficult to fit these blocks together, look at the corners, but this was created just 500 years ago. The temple as we see it today, was built by assembling blocks of stone, but the original temple that existed here used single stone architecture. If we calculate the area of the original temple using the distance between the bull and the lingam, it would stretch for many miles, making it the largest temple in India. What happened to the rest of the structures of this temple? Locals claim a huge flood happened many thousand years ago, which wiped out the rest of the structures of this original temple. The only features left out were the giant bull, the lingam and this giant footprint. The giant footprint was completely faded when the water receded. However, to remember the past and to make sure that it does not get corroded away, sculptors carved on top of the original footprint. So, locals admit to carving on the footprint but insist that it existed in the first place. India is the only country which has still preserved its ancient religion and monuments. Ancient Indian history, now known as mythology, is still read by millions of people. But the most important piece of history comes from locals. Local history gets passed on from generation to generation orally, and this man is not just another local, he is the official tour guide of Lepakshi Temple. 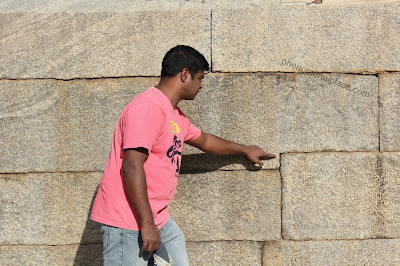 He explains that the original temple was built by gods and this footprint belongs to Sita, the wife of Lord Rama. He then tells me something startling: Sita was 25 feet tall, but she was a petite woman. During her time, everyone was 28 to 30 feet tall. And then, thousands of years later, Lord Krishna appears, and he stood around 15 feet tall. He also mentions that the builders of the new temple, who existed 500 years ago, were also 8 feet tall. 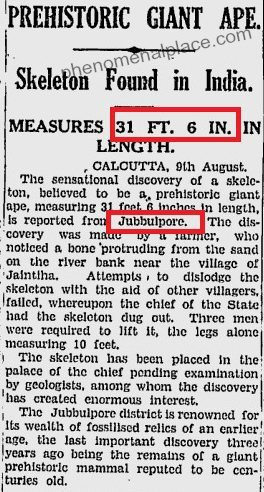 If this is true why don’t we find skeletons of giants? We find skeletons of 100 feet dinosaurs, and we find a new one every week, so why don’t we find these giant skeletons of ancient builders. Do we really not find these skeletons, or is this information suppressed by secret societies like the Illuminati to prevent us from learning the truth? We have plenty of newspaper clips about giants who stood 8 feet tall. Until the last 50 years, even archeologists admitted to finding these giant skeletons all over the world. Is it possible, that they were merely finding ordinary human beings who were just suffering from gigantism? After all, even today we have these giants who stand 7 to 9 feet tall. But the evidence of prehistoric giants gets better. Krishna was 15 feet tall. 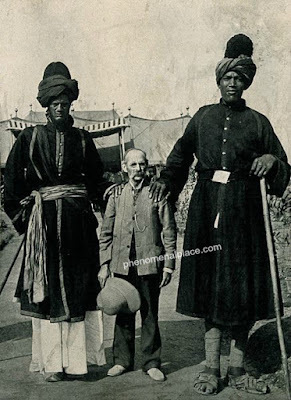 We have actual evidence of giants who stood more than just 9 feet tall. The Giant of Castelnau was 11.5 feet tall, and we have actual photographs showing that the arm bone of this giant is nearly twice as thick as our human bone. 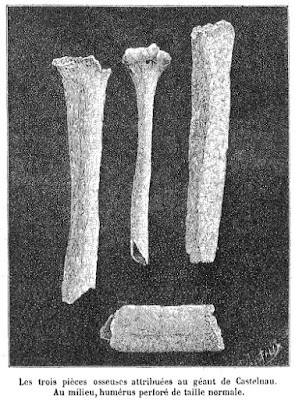 In this picture you can see the human bone in the center looks half as thick as the giant’s bone on both the sides. This is not a newspaper clip by the way, it was published in a science magazine called La Nature in 1890. This science magazine is still popular today in France and is published under a different the name (La Recherche). We have many other clips of giants who stood 15 feet as well. However, the biggest evidence of giants was unearthed in India itself. The tour guide claims that Sita was a short woman: 25 feet tall, but everyone else during that time was 28 to 30 feet. Is this really a tall claim or is it true? How about this piece of news showing a 32 feet giant unearthed in India? Published in more than a dozen different newspapers around the world, the footprint size would accurately match a giant of this size. I have talked about this news in detail in another video. Believe it or not, there are thousands of newspaper clips all over the world which show giant skeletons but somehow the general public is brainwashed by the new world order into thinking they are all hoaxes . So what do you think? 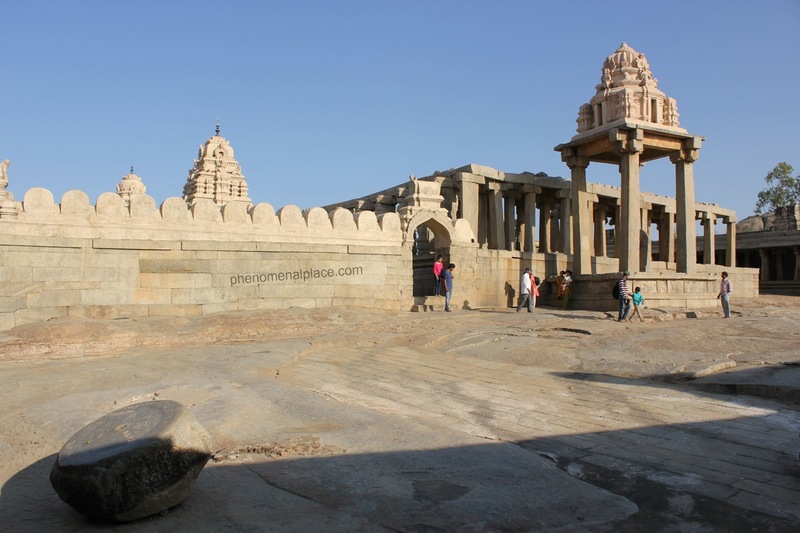 Did Giants build Lepakshi temple? Or are these evidences – the world’s largest bull, largest Nagalingam and the largest footprint just hoaxes to fool us? Is there some truth to what the locals are telling us, or are they lying to us? Please let me know your thoughts in the comment section. Sir,,, plzz visit NE India. The Kacharis( the oldest inhabitants of NE India) The Kachari Kingdom of NE India. Ruins of Kacharis found at Kachomari pathar in Assam, Ruins of Dimapur, Nagaland. Many thx for your great effort.As researcher in this fiel I would appreciate if you can inform the time and height of giants that existed. According to your search,during sita era height was arount 30feets.And during krishna's era it was only 15 feet. Could you please inform the approximate dating for both era.